There are moments in life that help define us and reinforce who we are and who we want to be. Any one of us can make a hundred mistakes, but if we step up to the plate and do the right thing when destiny calls, that single act can atone for any and all previous blunders, miscalculations and misdeeds. And Tony Stark had a lot to make up for, as his journey was beset by a multitude of gigantic faux pas, but in a single moment, when he stood up for free will, self-determination and the belief that people will make the correct choice for themselves rather than being slaves to a future that hasn’t happened, as far as I was concerned, he wiped his slate clean. 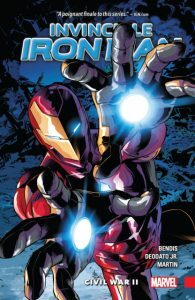 Invincible Iron Man: Civil War II is the behind the scenes story of a man who knows that he’s reaching the end of his pathway and that the decisions he’s made will ultimately lead to his downfall, and it’s a touching, endearing and intimate portrayal of a hero preparing for the future and saying goodbye. The last honest and open moments with an old friend, meeting his “successor” and realising it’s time to pass the torch to the next generation, finally embracing the truth of who he is and what he really believes in (apart from himself of course), it’s all here in Civil War II and it’s quite possibly my favourite Iron Man story ever. There a vulnerability and fragility to Tony Stark in these pages that we’ve never seen before, more so even than in the infamous Demon in a Bottle storyline, and just as reaches breaking point, the last person he would expect to do so, reaches out to Tony and offers him… Some form of alternative maybe? A way out? Who knows? The answer to the mysterious cliff-hanger that Invincible Iron Man ends on is for the future to decide. Which as Tony so firmly, and rightly, believes, is yet to be written.